Making use of the Heritage day long weekend, we booked a bungalow in Olifants camp from 24 to 26 September. Since Olifants is far from Pretoria, and we only had 3 days, we decided to leave after work on 23 September, and sleep at Lourie Lodge guest house in Phalaborwa. We arrived at Lourie Lodge rather late, but the room was great and the next morning we had a delicious breakfast in the Lodge’s beautiful garden before entering the park around 10am. We stopped at Sable Dam, where our first sighting was of a herd of elephant drinking and spraying themselves, before making our way to Olifants. 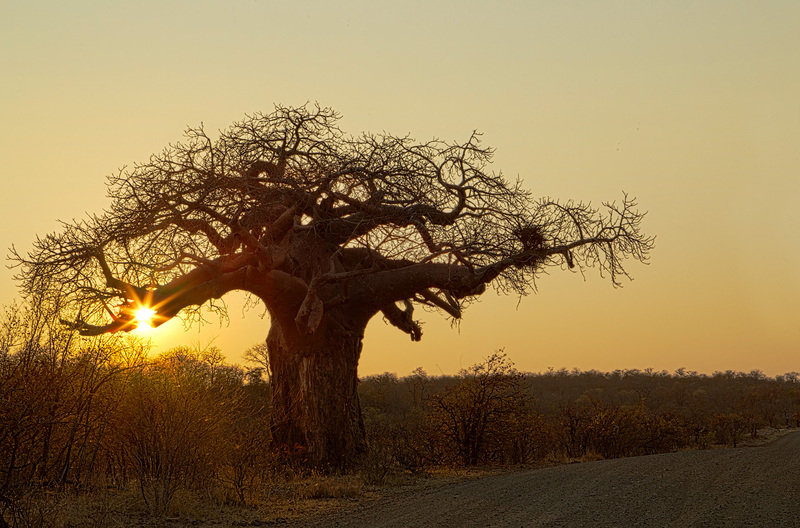 After checking in and uploading our baggage at our chalet, we left camp again, and spend some time photographing a large baobab against the sunset, eventually coming up with blended exposure that captured most of the beauty of late afternoon light. 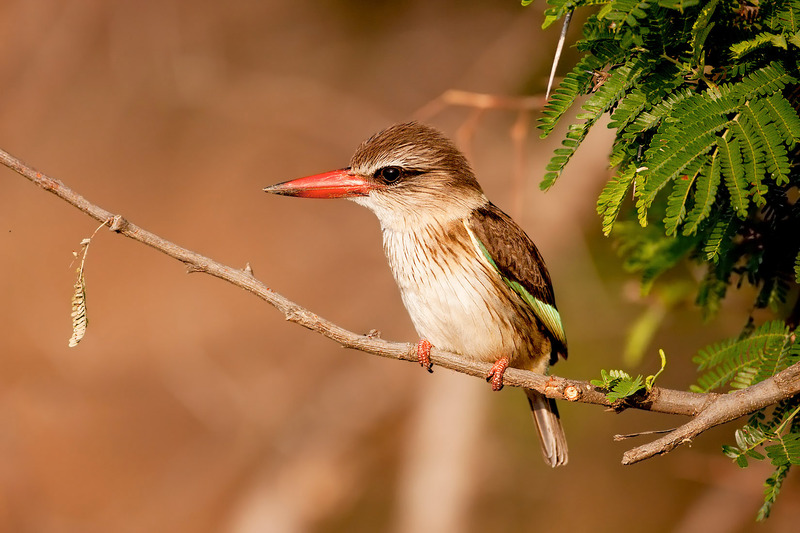 The next morning, we drove down to the Balule low-water bridge, where we found a pair of Brown-hooded Kingfishers hanging our in the trees on the river bank. Unfortunately, they were on the shady side of the river, so we ended up leaving, hoping that, like most Kingfishers, they would spend the day operating around the same area, and that we would be able to photograph them in the same place at sunset. 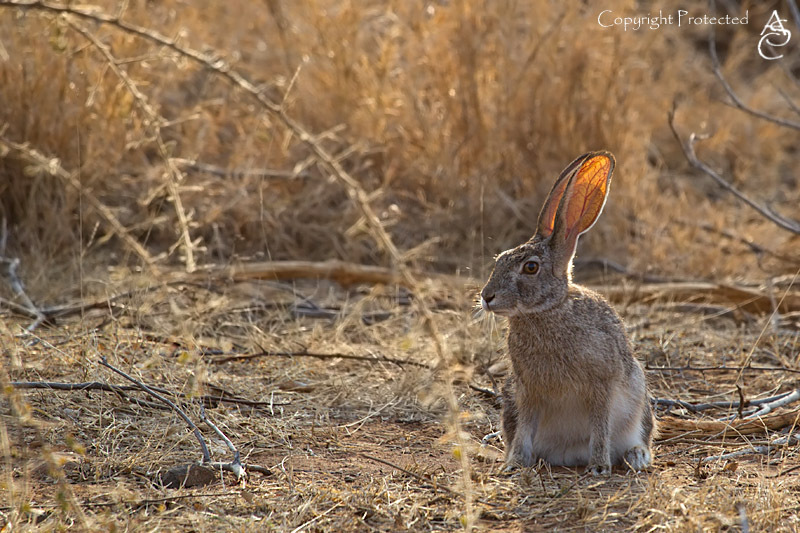 We spent the day driving around, seeing (and photographing the game for which the area is famous – impala, giraffe, lots of elephants, ostriches and even a pride of lion far off in the veld. On our way back to the river, we saw a spring hare – a first for both of us! Arriving back at the bridge, we were delighted to see the Kingfishers were still in the same place, not posing in perfect late-afternoon light. After taking a few shots, we left to photograph the the sunset from the more famous high bridge over the Olifants river. The third morning, much too soon, we had to pack up and leave the Kruger Park. 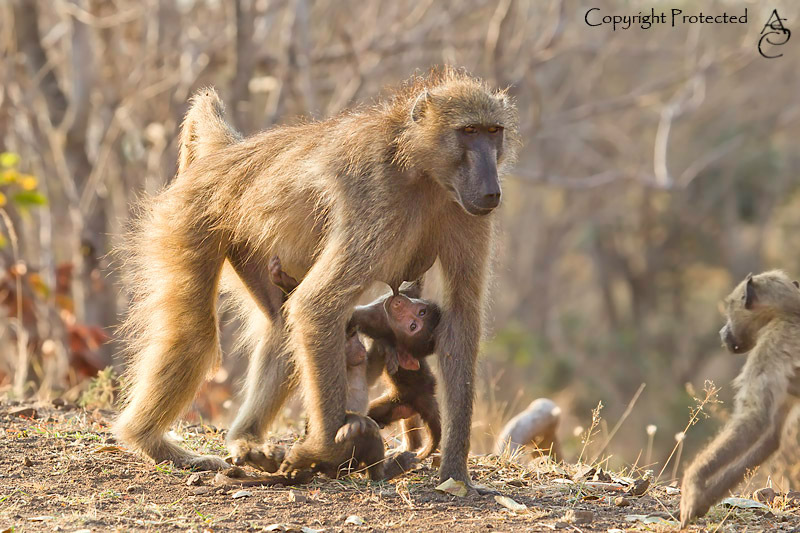 On our way out, we passed a troop of baboons, and, as always, couldn’t resist spending some time with them. 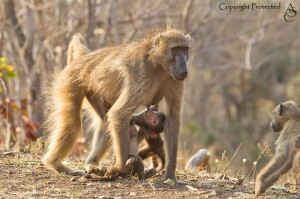 Baboons, with their comical shenanigans, almost always allow you to get at least one good photo!